As hands are wrung in the aftermath of the near-tragedy on a Northwest Airlines flight approaching Detroit, a conversation from London's Heathrow airport in 1986 comes to mind. 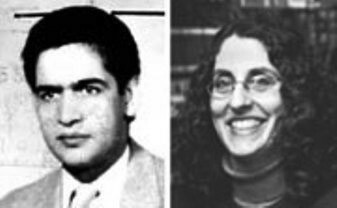 Nizar al-Hindawi and Ann-Marie Murphy. It consisted of an El Al security agent quizzing one Ann-Marie Doreen Murphy, a 32-year-old recent arrival in London from Sallynoggin, Ireland. While working as a chambermaid at the Hilton Hotel on Park Lane, Murphy met Nizar al-Hindawi, a far-leftist Palestinian who impregnated her. After instructing her to "get rid of the thing," he abruptly changed his tune and insisted on immediate marriage in "the Holy Land." He also insisted on their traveling separately. Murphy, later described by the prosecutor as a "simple, unsophisticated Irish lass and a Catholic," accepted unquestioningly Hindawi's arrangements for her to fly to Israel on El Al on April 17. She also accepted a wheeled suitcase with, unbeknown to her, a false bottom containing nearly 2 kilograms of Semtex, a powerful plastic explosive, and she agreed to be coached by him to answer questions posed by airport security. "What is the purpose of your trip to Israel?" Recalling Hindawi's instructions, Murphy answered, "For a vacation." "Are you married, Miss Murphy?" "No." "Is this your first trip abroad?" "Yes." "Do you have relatives in Israel?" "No." "Are you going to meet someone in Israel?" "No. "Has your vacation been planned for a long time?" "No." "Where will you stay while you're in Israel?" "The Tel Aviv Hilton." "Do you have a credit card?" "Oh, yes," she replied, showing him an ID for cashing checks. That did it, and the agent sent her bag for additional inspection, where the bombing apparatus was discovered. Security at Ben-Gurion Airport in Israel. Had El Al followed the usual Western security procedures, 375 lives would surely have been lost somewhere over Austria. The bombing plot came to light, in other words, through a non-technical intervention, relying on conversation, perception, common sense, and (yes) profiling. The agent focused on the passenger, not the weaponry. Israeli counterterrorism takes passengers' identities into account; accordingly, Arabs endure an especially tough inspection. "In Israel, security comes first," David Harris of the American Jewish Committee explains. Worse yet, consider the panicky Mickey-Mouse, and embarrassing steps the U.S. Transportation Security Administration implemented hours after the Detroit bombing attempt: no crew announcements "concerning flight path or position over cities or landmarks," and disabling all passenger communications services. During a flight's final hour, passengers may not stand up, access carry-on baggage, nor "have any blankets, pillows, or personal belongings on the lap." Some crews went yet further, keeping cabin lights on throughout the night while turning off the in-flight entertainment, prohibiting all electronic devices, and, during the final hour, requiring passengers to keep hands visible and neither eat nor drink. Things got so bad, the Associated Press reports, "A demand by one attendant that no one could read anything … elicited gasps of disbelief and howls of laughter." Widely criticized for these Clouseau-like measures, TSA eventually decided to add "enhanced screening" for travelers passing through or originating from fourteen "countries of interest" – as though one's choice of departure airport indicates a propensity for suicide bombing. The TSA engages in "security theater" – bumbling pretend-steps that treat all passengers equally rather than risk offending anyone by focusing, say, on religion. The alternative approach is Israelification, defined by Toronto's Star newspaper as "a system that protects life and limb without annoying you to death." Which do we want – theatrics or safety? Mr. Pipes, director of the Middle East Forum and Taube fellow at the Hoover Institution, has super-elite status at two airlines. Jan. 6, 2010 update: I lacked space in the column to play out this ultimate scenario: What if a very large group of hijackers gets on a plane, enough of them so that with muscle alone – no knives, guns, or bombs – they overpower the passengers and crew? What if they threaten the pilots to strangle one person after another until the plane comes under their control? No amount of technology can prevent such a scenario; only scrutiny of who is getting aboard can do so. And while there has been no such large group, "Those Fourteen Syrians on Northwest Airlines Flight #327" represented a possible step in that direction. Jan. 17, 2010 update: For updates on this topic, see my weblog entry "Airport Security or Security Theater?"